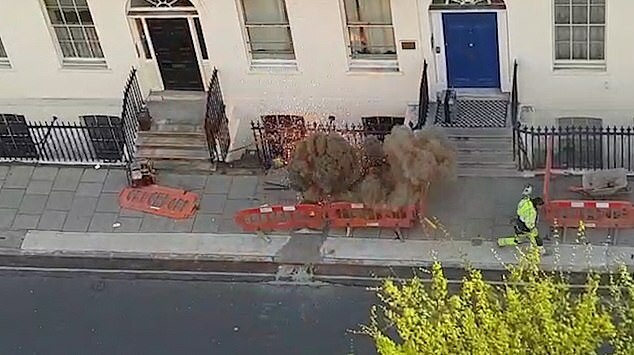 The exclusive footage obtained by MailOnline from Montague Street, Holborn, shows the man desperately dragging a piece of equipment away from a cordoned-off hole in the ground which had smoke billowing out of it. 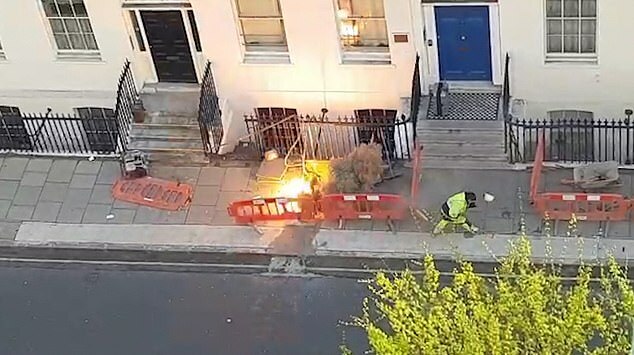 As he scrambles away, sparks begin to flash inside the hole before a huge flame bursts upwards, sending the workman's hat clattering on to the pavement and leaving 100 homes without power. 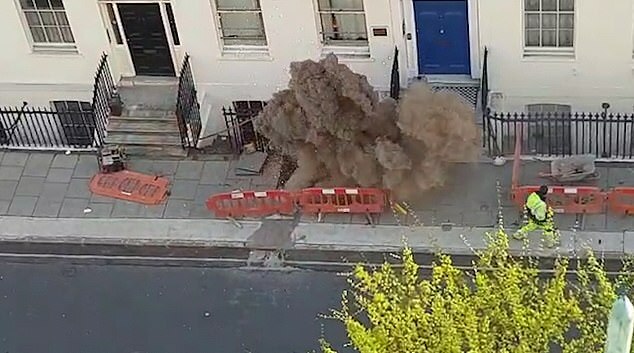 A witness to this morning's 8.40am explosion told MailOnline: 'The guys were climbing up the scaffolding when they saw there was a commotion across the road. 'They saw the smoke and the flames and then there was a lot more fire. 'Then it died down a little and the chap came running back to clear the equipment away when it exploded. 'The fire blew his helmet right off - it went sailing across the street. 'They were absolutely crackers, going back to the fire. 'The workmen returned to the fire several times to moves equipment and kept replacing the plastic barriers which repeatedly fell to the ground. The minute-long dramatic video begins by showing the workman, dressed in a high-vis jacket and trousers, pulling a large appliance away from the side of the property. He then races along the edge of the pavement, around the red fence cordon, as the explosion bursts out the hole. His white hard-hat is blown off his head and crashes down on to the ground, where he quickly retrieves it. While one of his colleagues rushes over, the workman scoops up another piece of equipment and pulls it clear of the blast zone. But this tool is attached to another item by a cord running under the fence, and so when he pulls it, part of the cordon is knocked over. The plume of smoke continues to pump out of the hole as two more helmet-clad workers arrive to help move the rest of the tools away. 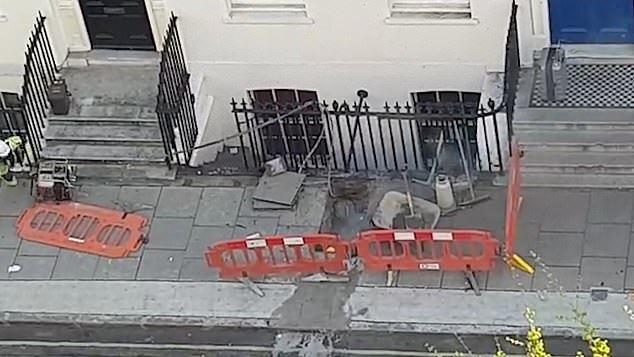 A UK Power Network spokesperson said: 'Our engineers are working quickly and safety to restore power to customers in the Montague Street area of London after third party damage to an underground cable around 9am this morning. 'An initial 72 properties lost electricity, with a further 28 having their supplies turned off for safety reasons during the repair. Moon 27° Libra 46' 53"